After spending most of 2011 doing the morning show, and later afternoons for a short time, I am moving to middays as of January 2012. While traveling over the holidays, I noticed that the majority of stations are voice tracking middays, or are simply playing liners between songs. Since I am in favor of being interactive with our audience, I'm mostly going live between 10 am and 3 pm Eastern Time. Another advantage? I am able to run commercial-free during the 11:55 am to 1:30 pm slot, this offering many listeners the benegit of a mostly-continuous music sweep while they are eating. Since we are being heard more and more on mobile devices, I'd like for you to hear more music during your lunch break. I am continuing in my desire to develop Big D Country into a country radio station that truly meets your desires and needs as a listener. If I can do something better, please let me know. "How can I get airplay on your station?" I receive this question, or some variation of it, every week and sometimes, almost every day. So today, I'm sharing the answer here on the blog. I'm sure before the weke is over I'll receive another email with the same question. Some stations and programmers do have a screening process. I didn't during my years in terrestrial radio and I don't now, but there are somethings you should consider. Our station is primarily country, with some country/gospel music included in our regular programming. Therefore, if you send me something that's heavy metal, rock, rap, etc., it's not going to get played. If you're not sure your style fits us, please take a few minutes to listen, and get a feel for the station and its music. Within the country genre, I do play mainstream top 40 country, classic country, traditional country, some pop country, independent artists, and some crossover country. I personally like a lot of kinds of music, so if it leans country, chances are I will at least give it a chance. 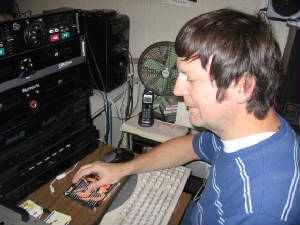 Most of the time, I will pick and choose music for on-air play within a couple of weeks. Usually it happens faster, but if the playlist is pretty full, I may have to wait a bit before making the add. Once a song has been selected, you will usually receive an email from me letting you know that your song is being played. In addition to the station, I do a daily live air show, have a small direct mail business, live on a farm and have animals to take care of, and do most of the cooking for our family. I want you to know: I'm aware of a lor of dissatisfaction with corporate radio today. Big D Country is my one and only station. Frankly, one is plentyif you want to do it right. I tried operating a second station in 2006 with a Christian format, and it did well..at first. But the support it received financially translated to a station that could afford to broadcast about four hours...a week.So I now devote some time on Sunday to the Christian programming that did the best. It seems to work better this way. Artists, thank you for sharing your music. We'll do our best to play it when possible.